We just updated our page on live videos on chin implant surgery covering topics like revision surgery, chin reduction surgery, keys to a successful revision chin surgery, and fillers in the chin to help with chin aging. For chin implant revision surgeries, if you are considering a smaller implant, you should know that putting a smaller implant is better than taking the original chin implant out without putting anything back in. If no chin implant is replaced, the chin can ball up and deformities can arise. Chin revision surgeries always make the mental nerve harder to identify. Also we believe in fixing the chin implant and leaving less room for error. Titanium screws fix the chin implant so that there is less motion, there is less risk for movement and asymmetry, there is less chance for infections, there is less erosion. This takes longer but we like the much better results. For chin reduction surgery you will see how it is done in a live video demo. We make the incision under the chin in a well hidden position. Chin reduction can be done for feminization for females and transgender females. The chin is burred down with a drill and soft tissue is removed to help the chin adapt. Chin Implant revision story. Things to learn about your Chin Augmentation revisional procedure. This is based on a true story: We recently had a patient who came to us with a chin implant placed through a revision procedure by a well known surgeon in our community. 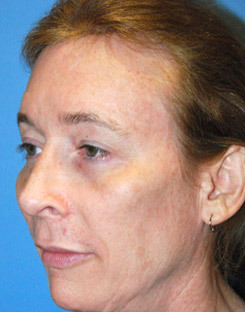 The chin implant was protruding off the bone and was causing pain and asymmetry. We were worried about the implant coming out of the skin. The patient was worried about this and the pain it was causing. This was their second chin implant in the same location. We were going to do the third chin revision implant surgery. What we found was that the nerve had a lot of scar tissue that prevented our visualization of the nerve. This was likely the reason the implant was forced into a more inferior location. This lower placement directed the lateral wings of the implant off the inferior edge of the jaw bone. Thankfully, through careful dissection we were able to find the nerve. This allowed us to elevate more of the tissue off the jaw bone and allow the right location of the implant. After the procedure, the patient was very happy with the outcome and there was no more protrusion from the bone and no more continual pain. Click here to read more about Chin Implant Revisional Surgery. Posted in Chin Surgery, Facial Implants, Procedures | Comments Off on Chin Implant revision story. Things to learn about your Chin Augmentation revisional procedure. You can read more about Cheek Implants by following this link. Dr. Young from Aesthetic Facial Plastic Surgery. 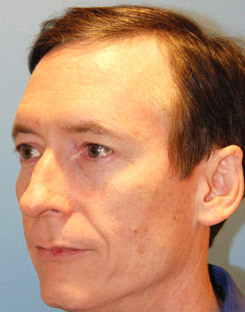 Nasolabial Folds Treatment by Dr. Philip Young Seattle | Bellevue, Options and New Ways of Approaching this Area: Treating the nasolabial folds seems like a very specific issue and separate from all the rest of the face. This approach has been used in the past. We did facelift to pull the fold up. Implants to the Nasolabial Fold: we used tissue to fill in the crease with fascia, alloderm, implants of silicone, goretex etc. We have used Mid face lift to pull the cheek upwards to help this area. Fillers have been commonly used to approach this fold with a minimally invasive thought. 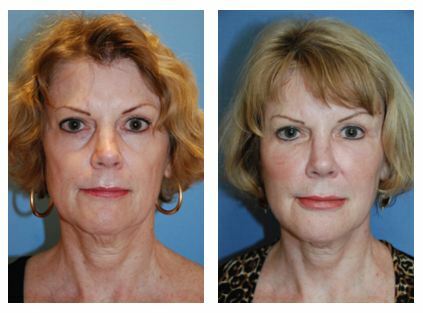 Facial Implants have been used to fill in the space under the fold with some success. All of these approaches seem to work to some degree, with fillers have a more temporary duration and Solid Implants having more of a longer lasting effect. Perhaps the better way of looking into the nasolabial folds is to address them from a global perspective and approach them as being a part of the general advancement of aging of the face as a whole. Here is a before and after of the YoungVitalizer. Feeling good on the outside by www.drphilipyoung.com: We all try to live a healthy life. Whether that be through our food and exercise, we also need to take care of our skin and face. There are many damaging obstacles that our face comes in contact with. Sunlight, pollution and our own natural aging process. Thanks to advances in technology and medical treatments, repairing damaged skin and reversing the noticeable signs of aging has become easier, faster and less painful – and can often be done without surgery. Quite literally, it’s possible to have a treatment today and be back at work tomorrow. Botox injections ease wrinkles in the upper third of the face. Effects typically last for 3 to 6 months. Chemical peel removes fine lines and smoothes the skin, especially around the eyes and mouth. New filler injections are used for lip augmentation and to treat wrinkles and skin folds. Effects typically last up to a year. Laser resurfacing treats sun-damaged skin, scarring, and other facial skin problems. It also works well on stretch marks, especially when treated early. Microdermabrasion erases ultra-fine lines, rejuvenates the complexion, and helps restore healthy skin tone and color. It is also very important to be on some kind of skin care regimen, including sunscreen of 30SPF. Making a few changes to your daily routine can pay off in healthier, more youthful looking skin. Daily doses of vitamin E (200-400 IU) and vitamin C (500-1000 mg) as both have been shown to stimulate collagen production. Adults aged 40 and above should add a daily calcium supplement of 600-1000 mg. Multi-vitamins containing Evening Primrose oil and green tea extract can also benefit the skin. Many skin care products now contain vitamins and antioxidants. Products with vitamin C can help against fine lines and wrinkles, stabilize collagen and help sunburned skin. 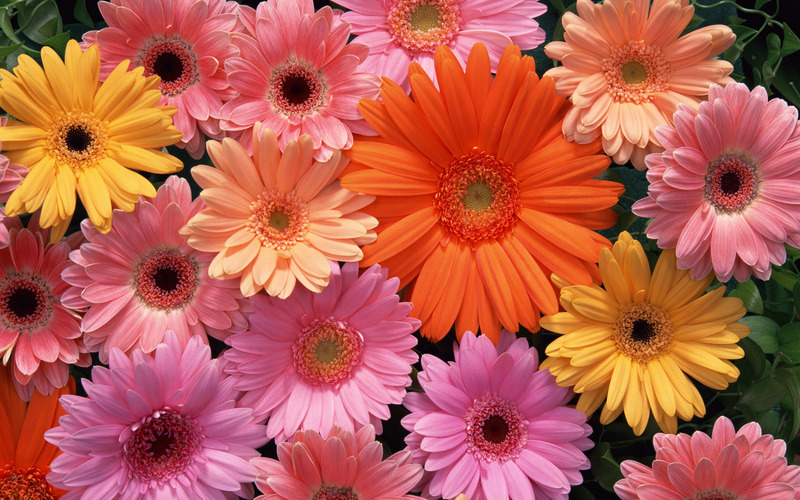 Vitamin C also works to lighten darker skin pigment by decreasing melanin. Vitamin A can also help fight wrinkles and brown spots, a common problem after pregnancy for Asian women. Before choosing your skin care products, it’s important to know your skin type. Those with dry skin should add moisturizer every day, while oily skin needs regular cleansing, with moisturizer applied only sparingly. Those with sensitive skin should avoid perfumed products and herbal extracts, as these can irritate the skin. If you’re unsure about your skintype, feel free to schedule a complimentary consultation with our Aesthetician Tanya. The YoungVitalizer can be a substitute for many traditional procedures like a face lift, mid face lift / cheek lift, lip augmentation, eye lift, etc by Dr. Philip Young Seattle. The YoungVitalizer can be a substitute for many traditional procedures like a face lift, mid face lift / cheek lift, lip augmentation, eye lift, etc by Dr. Philip Young Seattle. The YoungVitalizer can be a substitute for many traditional procedures like a face lift, mid face lift / cheek lift, lip augmentation, eye lift, etcWhy is that? Well a big part of the aging process is a volume loss and if you had a way to replace the volume in the face, doing so in special areas can make you look incredibly younger. It is our secret on how to do this. But there are ways to volumize the eyes, forehead, temple, lower eyes, cheeks and mouth area to substitute and replace face lifts, mid face lifts / cheek lifts, upper eyelifts, lower eyelifts, cheek implants, jaw implants, chin implants, brow lifts, temple lifts, etc with the YoungVitalizer. That is why we call the YoungVitalizer, the Breakthrough Incision Less Face Lift. The idea of cutting away tissue is becoming an older idea. Cutting away changes the face. The only situation that cutting away tissue can come into play is if your face changed dramatically since when you were younger. Aging is like a grape changing into a raisin. Traditional procedures tended to make that raisin into a smaller raisin. This action and process would make the raisin contorted. Because now you are trying to shape the raisin into a smaller volume. Some of the skin of the raisin will just not conform to the smaller volume you now have because you lost it from the transformation from a grape to a raisin. Replacing this volume will play a huge part in making the raisin back into the grape again. See this introduction video to the YoungVitalizer. Posted in Chin Surgery, Facial Implants, Fat Transfer / Fat Injections, Fillers / Facial Fillers, Juvederm, Lip Augmentation / Lip Fillers / Lip Injections / Lip Reduction / Lip Grafts / Lip Advancements / Fat Injections of the Lip, Midface Lift, My Journey to Find and Attain Beauty, YoungVolumizer | Comments Off on The YoungVitalizer can be a substitute for many traditional procedures like a face lift, mid face lift / cheek lift, lip augmentation, eye lift, etc by Dr. Philip Young Seattle. Volume changes in aging is taking more prominence in our thinking about facial aging by Dr. Philip Young Seattle | Bellevue: This is a new report which I thought was interesting. It discusses more of the idea that volume is the likely playing more of role in facial aging and not drooping. This is more evidence that the future of facial plastic and reconstructive surgery and facial rejuvenation surgery lies in volume replacement instead of tissue reduction / excision. Here is an interesting article in Plastic Surgery News on this subject. Below is a before and after of our incision less face lift alternative called the YoungVitalizer. Plastic Surgeons typically approached facial plastic and reconstructive surgery by reducing and excising away tissue. The results often lead to a tighter and unwanted look. These results have made people who have received plastic surgery in the past look like they had something done. The question is why that occurs. As you age, the process is really dominated by a volume loss in your face (And your whole body for that matter). You lose volume all throughout the face. But what it appears to others though is that your face is dropping or sagging. How does this occur? Well, as you lose volume, the skin and tissues are no longer pushed forward away from the facial skeleton. Without this volume support the tissue, the only way for the tissues to move is down and inferiorly, therefore the sagging. So, in the past, plastic surgeons would see this drooping and would try to correct by lifting and cutting away tissue. This is also compounded by the fact that plastic surgeons were surgeons. What we mean is tht surgeons have been trained all of these years on the art of cutting and surgical procedures. Naturally over time, they had a predisposition to cutting things away. This is the genesis of the reduction philosophy in plastic surgery. 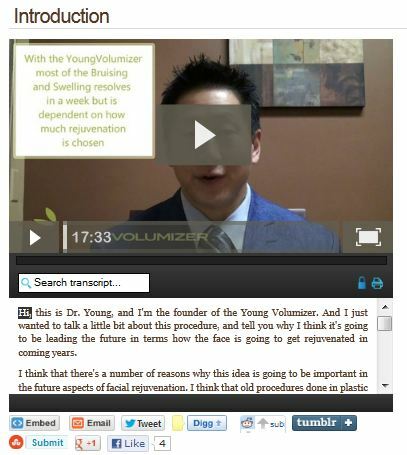 See our Introduction video on the YoungVolumizer now called the YoungVitalizer. Why is this approach unatural? There is an easier way to answer this question and we have a great analogy. Your aging is analogous to a grape and it’s change to a raisin over time. This process of change entails a lot of volume changes. The grape is the volumized version of the raisin. Plastic surgery has traditionally approached facial rejuvenation by making this raisin into a smaller more pulled raisin. They made incisions in the raisin’s wrinkles (from being dried up) and then excised the skin of the grape to make things tighter. As you can start to see, the raisin that has gone through this approach can never really look like the grape it once was without some type of addition to the volume of the raisin. We are advancing in our understanding of facial rejuvenation and the above ideas are central to this change in thought. Volumizing is playing a major role in this improvement of our approaches. It began with fillers in the 1990’s and possibly earlier. The nasolabial folds were the first areas to be volumized in this spirit. Collagen started the trend where restylane now dominates. This technique then began to be applied to other areas of the face such as the marionette lines (lines inferior to the corner of the mouth), lower eyelid hollows and bags, and the rest of the face. Because of the temporary results that were achieved from restylane (6 months to a year at best), other options began to surface and resurface. Long acting injectable fillers include radiesse (a natural bone product made up of calcium hydroxyapatite), artefill (methylmethacrylate microspheres), sculptra (poly-L lactic acid). Most of the results obtained by the longer acting fillers were like restylane but had the potential to last much longer. What has been found through experience, though, is that the longer acting injectables eventually do lose volume over the course of a year but the actual materials can persist for longer. How do we make sense of this? Part of the reason why is due to the carrier molecule that becomes absorbed (glycerin, carboxy methocellulose, etc). With this absorption, the results also wane. Silicone has been used as injectable filler, but the results are variable from good to disastrous. As I mentioned, other options began to resurface with this new interest in volumizing. This new idea for more natural results, fat injections began to make a comeback. The process includes harvesting fat from another part of your body (abodomen most commonly but also hips, waist, side of the legs) and then it is refined and injected into various parts of the face. The results from fat grafting in the face can be amazing. The main issue with fat grafting is finding the most optimal technique to achieve the most reliable fat survival results. Consistency has been a major challenge for plastic surgeons. There are many steps that are taken with fat grafting that can play a role on the fat’s survival. It has been difficult to study every aspect of this process. But research is continuing. The plastic surgery community is doing all that it can to find the best alternatives including fat grafting and volumizing the face. In terms of fat grafting, there are many ways to approach this complicated endeavour. Just as many different artists will draw a face in an infinite amount of varying ways, so too can a plastic surgeon volumize a face in a those infinitesimal ways . The Young Vitalizer is an amazing approach to volumizing the face. Other alternatives to volumizing the face is the use of facial implants. Facial implants are most commonly placed in the chin, and cheeks. Implants for the rest of the face have been used but with less frequency. Implants, however, require a significant surgical procedure to place them in the face which many people are not excited about. This is one of the reasons that fat grafting has taken such a big part of the stage in natural facial rejuvenation through volumizing. This is a question that a person was asking regarding taking out implants less than a month after they were put in. These implants were placed by another surgeon. 5 days is too early to judge your results after genioplasty. Right now you are going to have a tremendous amount of swelling. You have to wait at least a week and up to a month for it to really look good. Generally, I tell people that you will have 60% of your healing at 6 weeks, 80% at 6 months and the rest occurs up to 2 years later. So be patient. It will get better and most of the time things can be changed back to the way they were or altered a bit. I personally prefer chin augmentation to genioplasty. Chin augmentation is generally, through many studies, associated with less complications than genioplasty. These complications can include, nerve damage, a step off deformity, bone loss, problems with the implants or titanium plates and screws used for the fixation of the chin implant or the genioplasty segment that is advanced.